Get noticed for all of the right reasons in the Salvatore Ferragamo® Garda. Round-toe silhouette with gold-tone Gancio bit. Rich leather lining and insole. 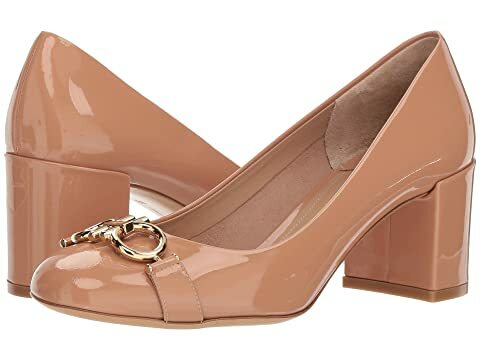 We can't currently find any similar items for the Garda Round Toe Pump by Salvatore Ferragamo. Sorry! Overall: Rated: 3 stars! Comfort: Rated:2 stars! Style: Rated:2 stars! Had high hopes for this shoe. I tried the silver and loved the silver color. Hence the higher rating. But it was tight in the forefoot and the heel was just really big compared to the rest of the show. For the price, I wanted something more comfortable and not so trendy that it would be outdated in a couple months.